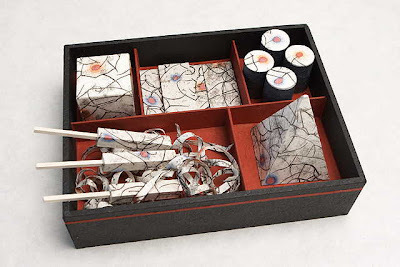 "Electronic Bento Box" was created in 2006 for an exhibition sponsored by the Japanese Paper Place called "The Power of Two". 14 artists were given sheets of hand-made Japanese paper and asked to decorate them in the medium of their choice. These papers were then distributed by lottery to 14 other artists who were asked to turn the sheet into an object in their own chosen medium. The results ranged from pieces of furniture to a delicate little hanging mobile. I chose a paper that had been printed by Susan Low Beer, who remarked in passing that it reminded her of an "electric hedge". To me it suggested a kind of light-up sushi but I liked the "electric" reference, hence the title.